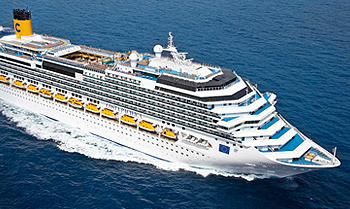 View all Costa Pacifica cruises or view more options for Costa cruises. Elegant and sophisticated, Costa Pacifica offers guests a unique holiday, lavishing on them all that is best in Costa cruising. Follow the music, enjoy different musical genres in the ship’s public areas and discover the exclusive arrangements for Costa Cruises. Harmony on board: experience it to the full. Elegance and warm colours greet you in Costa Pacifica’s Theatre, decorated to a musical theme and set off by a wonderful central chandelier in Murano glass. Choose the best seat and enjoy the absolute purity of the innovative and unique sound system. Designed for those who want to live their holiday to the full, the Formula 1 Simulator gets the adrenaline running. Take the driver’s seat, experience the thrill of driving the fastest racing car of all time, look at the sea, then try to stop – if you can! Have you experienced the pleasures of life on deck in winter? The sliding glass roof enables you to enjoy the ever-changing face of sky and sea at all times of day. And there is more: thanks to a giant eighteen metre square screen, you can watch videos and movies up on the main deck. Discover the pleasure of total relaxation: Samsara Spa is a Well-being Centre six thousand square metres in area, entirely devoted to restoring your physical and mental balance. Samsara means steam baths, age-old rituals and regenerative beauty treatments. And, in addition, suites and cabins with direct access to the spa area. 5 restaurants, including the Club Restaurant and the Samsara Restaurant, at an additional charge and by reservation only. 308 originals and 5,929 prints on board, acquired with the artistic advice of Nicola Salvatore of Studio Cervi & Rossi.